Hungry yet? We are. This month we visited Old Stone Orchard in Little Compton, Rhode Island. A nice little farm that draws families August through November, Old Stone offers not only a wide variety of apples but pumpkins, gourds and eggplant too. Parking is easy and just steps away from the orchard itself. In addition to pick-your-own, they also have a well stocked fruit and vegetable stand so running in is quick and easy for anyone who is on the go. 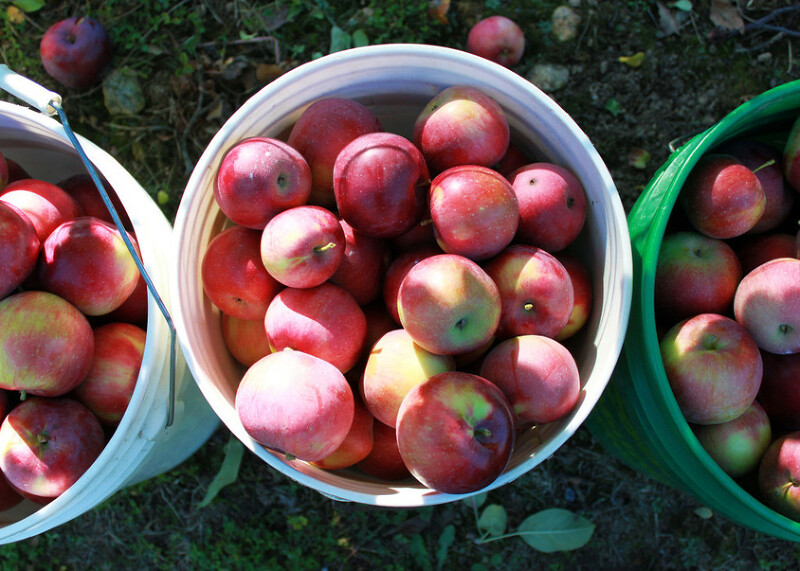 Hours at the orchard are Thursday – Sunday, 10am – 5pm. You can also find out more information at their Facebook page. Now, in case you leave feeling inspired (and you just might), we’re including a family favorite recipe, courtesy of Betty Crocker. We hope you like it! Heat oven to 425°F. Make pie crust mix as directed for 9-Inch Two-Crust Pie, using 1/3 cup cold water–except trim overhanging edge of bottom pastry 1 inch from rim of plate. Stir together 1/2 cup sugar, the flour, cinnamon and nutmeg in large bowl. Add apples; toss. Spoon into pastry-lined pie plate. Dot with butter. Roll remaining pastry; cut into 10 strips, each about 1/2 inch wide. Place 5 strips across filling in pie plate. Weave a cross-strip through by first folding back every other strip of the first 5 strips. Continue weaving, folding back alternate strips before adding each cross-strip, until lattice is complete. Trim ends. Fold trimmed edge of bottom crust over ends of strips, building up a high edge. Seal and flute. Brush lightly with milk; sprinkle lightly with additional sugar. Bake 30 to 35 minutes or until crust is golden brown and juice is bubbly.